Don’t miss out on the most exceptional, inspiring buying experience of 2017! The High Point Market in North Carolina is the largest furnishings industry trade show in the world, bringing more than 75,000 people to High Point every six months. With 180 buildings and more than 2,000 exhibitors, if you can’t find it in High Point…it probably doesn’t exist. We represent 11 of the best multi-category showrooms at High Point Market. You will be able to shop everything you need for all of your projects by visiting our 9 trusted vendors. All of your questions regarding High Point Market can be answered on their website HERE. CFC 114 S. Elm St.
Phillips Collection is gearing up for opening night of market with a bang! Come by Saturday between 4pm & 8pm for to Phillips Collections’ famous networking event Meatballs, Moonshine and a Pork Belly Carving Station. The event is open to all and was established to help create connections. Join Jaipur Living in celebrating the launch of three Capsule Collections. Meet the design team from world-renowned textile creator Pollack, fete the art-design collaboration of Zoe Bios Creative, and connect with the unique vision of textile designer Aviva Stanoff. Each has partnered with Jaipur Living to create truly inspirational pieces that relate back to their custom fabrics, one-of-a-kind art pieces, or magical vision. Toast these designers and their new ventures over cocktails. Design Director Rachel Doriss of world-renowned textile creator Pollack presents a lively CEU presentation on the design process of creating functional yet beautiful textiles, from inspiration to final production. This course invites participants to start with the spark of inspiration and examine in detail how choices of material, construction, pattern, and color are resolved to create a physically and aesthetically functional fabric. We share techniques for gathering and refining sources of inspiration, followed by the specific steps and methods used —some traditional, others cutting-edge – in developing a textile from start to finish. Do you dream of seeing your designs featured in a magazine? Join us for a meet and greet with Lighting & Decor Editor Nicole Davis. Learn what the publication looks for in an editorial feature, how to pitch the team on your designs, what photo quality is needed, and more. Mix and mingle at market! Join Leftbank Art for a fun night of cocktails, canapés, and music while checking our Barclay Butera’s latest collection! There will be photo opps, raffle drawings for signed pieces from Barclay’s collection, and chances to win a signed copy of his beautiful coffee table book, Past Present Inspired, a retrospective look at his own spectacular homes. What makes a good rug? CEO Yogesh Chaudhary of Jaipur Rugs, which elevates the work of 40,000 artisans and weavers across India, will speak to the art of a handmade rug. Category Manager, Mallory Appleton will share information on our machine made and naturals collections. Which construction is right for which space? How do you care for each construction? How do you tell quality? When do you know if you are getting a good deal on a rug? What would you look for online and in a catalog description? Join Jaipur after a day of shopping market for a festive Henna happy hour at the Jaipur Living Showroom (Showplace 3300) with the opportunity to meet Ivy Co-Founders Alex Schinasi and Lee Rotenberg, and Jaipur Living CEO, Asha Chaudhary. Enjoy cocktails and vegetarian hors d’oeuvres over inspiring conversations with designers from across the country. Ask about free freight on orders placed in Cyan Design’s High Point Showroom. D.V. Kap will be unveiling their brand new line of custom, handmade upholstery furniture at High Point Market! Contact your Bassman Blaine Territory Manager for more information. Receive 10% orders on Jaipur Living’s Naturals and Tufted rug collections as well as 10% off 10 accessories (mix and match pillows, poufs, and throws). Join them for delicious Vegetarian Lunches in their showroom every day during market. Free shipping on confirmed orders over $1,500 placed at High Point Market on all items (excluding furniture). Buy four pieces of furniture and receive free freight. 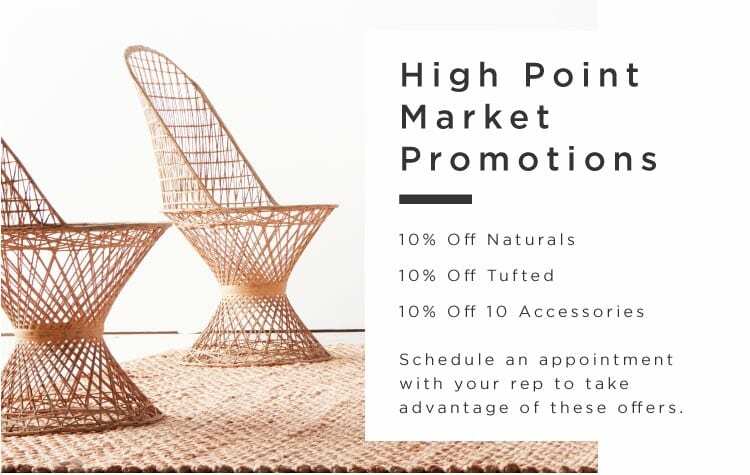 Not attending High Point Market? Receive free shipping on confirmed orders over $2,500 (excluding furniture) for the month of April. Join Worlds Away for their 25th anniversary celebration. All business drop orders over $3,000 placed and confirmed at High Point Market will ship for free. (Worlds Away reserves the right to select preferred carrier for promotion).